We’re going slightly out of order on our timeline resource because I wanted to review the Classical Conversations composers first. We read George Handel (Getting to Know the World’s Greatest Composers) . We listened to Water Music and Messiah. Here’s just the Hallelujah chorus, and I also made a Handel playlist on Youtube of those and a few others. We just played it in the background while we did school or ate lunch. Classics for kids has a radio show about Handel which we listened to. We read the Thomas Tapper book about Handel. You can listen to it here. 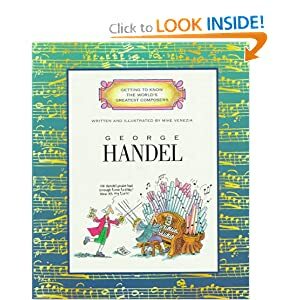 Bear read and narrated the George Frideric Handel biography at Making Music Fun. She used the notebooking paper at That Resource Site (page 4 of the set). At the end of all the composers, we will bind the biography printouts and the narrations into booklets. I think I will keep them separate so that I can reuse the printed biographies for J-jo in later years. Both kids colored Handel from the timeline resource and glued it onto their timeline. We also put up Handel’s composer card on the wall with Bach.